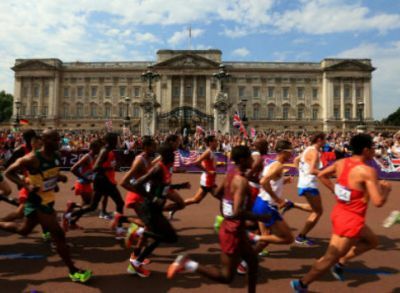 The route started part way along The Mall which links Admiralty Arch and Buckingham Palace. The road is not that old. having been created in the late 19th century. It seems that the British Empire required a central boulevard at least equal, if not better, than those of Continental capitals. Starting just outside Clarence House, the home of the Prince of Wales, you have the Victoria Memorial behind you. It was dedicated in 1911 by George V and his first cousin, Wilhelm II of Germany, Queen Victoria’s two senior grandsons. Three years later they were at war. 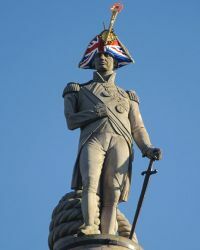 As a walker you will need to take one of the smaller gates at Admiralty Arch which dates from the same period. Trafalgar Square itself was styled by Sir James Barry in the 1850s. He is best known for his work at the Palace of Westminster which follows later in the route. It is then down Northumberland Avenue. You can stop and take lunch or tea at the Corinthia Hotel. No time for a show at the Playhouse Theatre. You will then pass the Savoy Hotel which sits behind Embankment Gardens, nice for a quiet sit down or perhaps on the way back. Past Cleopatra’s Needle, the oldest memorial on the route and dating from around 1450 BC, presented the to United Kingdom in 1819 by the ruler of Egypt in commemoration of the victory of Lord Nelson at the Battle of the Nile. Passing an area known as The Temple, and the home of lawyers, you will at that point be entering the City of London. Unique in having entrances on both the north and south banks of the Thames Blackfriars Station is run/walked under. For walkers the next bit should be easy as you climb via Puddle Dock and Ludgate Hill towards St Paul’s Cathedral, the creation of Sir Christopher Wren after the Great Fire of London in 1666. Guildhall is another place worth stopping for, the ‘offices’ of the Lord Mayor of London, not to be confused with The Mayor (Boris Johnson), whose place of work is City Hall on the South Bank, which the Marathon bi-passes. From the Guildhall, the route passes the Bank of England (which has a museum with real gold bars) down Cornhill passing the Royal Exchange, once the centre of commerce but now a luxurious shopping centre. At the end of Cornhill continue into Leadenhall Market, full of food shops and small traders. In its present form it dates from 1881. 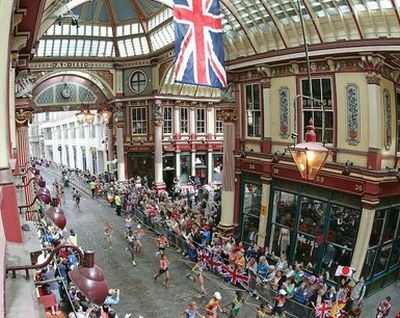 Competitors then made their way onto Eastcheap, via Fenchurch Street and Gracechurch Street, and on towards the Tower of London which needs no introduction and is the turning point. 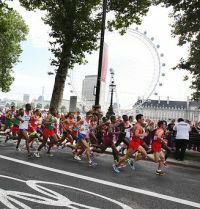 If you are wondering why the annual London Marathon does not take the same route this is because only Greenwich Park can take the 35,000 starters. The Olympic event concerned just 100 would-be winners. 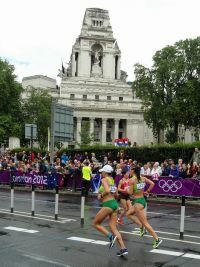 On Tower Hill, a short distance from the Tower's moat, the course made a U-turn back to Lower Thames Street at the start of the return leg. Leaving Lower Thames Street you pass The Monument dedicated the Great Fire already mentioned (walkers might not be interested in the 311 steps to the top, the highest stone column in the world) and then it is on to Victoria Embankment. Walkers (and perhaps even runners) at this point can see the London Eye, currently the best viewing point for the route, about to be overtaken by The Shard (next spring), a more steady vantage point. Just before turning right into Parliament Square is (New) Scotland Yard the home of the London Metropolitan Police. You pass the Queen Elizabeth Tower home of Big Ben and the Houses of Parliament comprising The Commons and The Lords. Next up is Birdcage Walk home once of the Royal Menagerie with HM Treasury on the right. Can just see Horseguards Parade. St James’s Park, also to the right, is the oldest of the London Royal Parks, very pretty and with a large lake. Finally on your walk you will approach the rear of Buckingham Palace. Contrary to popular belief what the public sees is the original back of the Palace, which itself dates from 1700. The present building was reconstructed by Prince Albert around 1850 although, just like any home, it gets re-modelled internally from time to time. The palace's state rooms have been open to the public during August and September since 1993. The Queen’s Gallery and the Royal Mews have an all year around opening timetable.